Beautiful tulle and ball gown with a romantic off-the-shoulder neckline, sheer illusion inset and lace-up back closure. 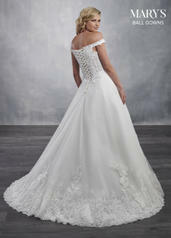 The entire bodice has been accented with caviar beaded lace applique and crystal beaded trim. The skirt finishes with a wide lace border, sweep train and matching tulle cape.